Mobile video chat was all the rage last year. But the new battleground is now becoming group video chat. Oovoo kicked off the competition late last year and now Fring is keeping pace with a group video calls, a new feature now launching in limited beta. Fring’s group video chat functionality allows four people to hold a free conversation at once on both Android (s goog) and iOS (s aapl) devices. The service works over cellular and Wi-Fi. Oovoo launched six-way chat in December allowing people to talk between Android devices and PCs and Macs. Oovoo’s full six-way chat is a paid product, however, users can always hold a three-way conversation at no charge. That’s apparently why Fring is touting this as the first time users can have free mobile group video chats, which technically isn’t really accurate. The group video chat is in limited beta and users will need to fill out a form to join. You can sign up here and you can also add three other friends to ensure you have enough people to talk to. It’s unclear when the service will be available for all users. Another good question is how the service will actually perform. Oovoo impressed my colleague Ryan Lawler because its cloud-based approach enables smooth group video chats over Wi-Fi and 3G, because the audio and video processing happens remotely. It’s unclear if Fring will take a similar approach. Even though this is not the first mobile group video chat service, it signals the rising competition in the mobile video conferencing space, which has gotten crowded with the likes of Tango, Skype, Qik and others. Last year, Apple (s aapl)opened a lot of eyes to the power of mobile video chat with FaceTime, which has now expanded beyond iPhone 4s to iPod Touches, the iPad 2 and Macs. But now competitors are looking not only at cross-platform support, but also group chatting as a way to compete. Do mobile users really need to chat with multiple people at once? The answer is unclear and it sounds like more novelty at this point. It’s sometimes hard enough to get one other person on a mobile video call let alone three others. But as we get more comfortable with video chatting and more devices including TVs support video chat services, I think it makes sense to offer as many options as possible. 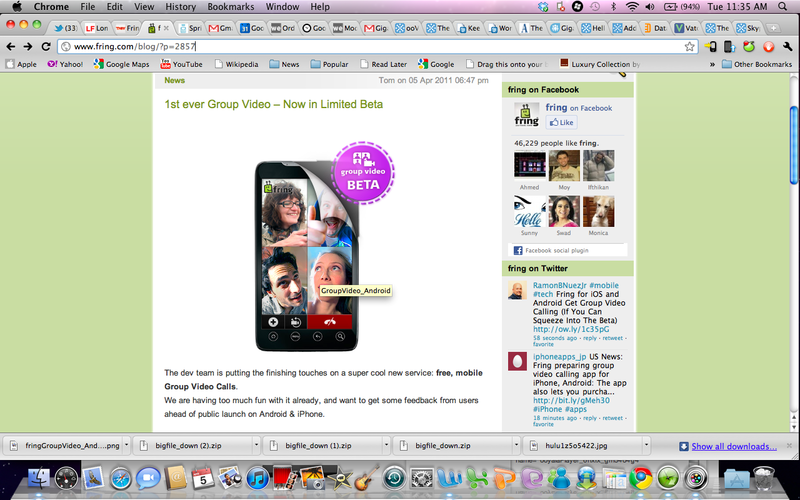 Take a look at a video of Fring’s group video chat in action below.